* What should we do if our iPhone/iPad is just damn out of battery when we are watching the video in high spirits? * Is there any way to access video playlist via web browser from one server to my PC at home? Air Playit is a nice choice, which comes with the ability for seamless accessing to video and music playlists from any web browser with the built-in HTTP server. Thus, you can take advantage of VLC and Apple QuickTime Player to play the streaming video easily. You are able to create your home video library on your PC with HTTP video streaming server, watch any streaming video on web video player easily. How to Create Home Video Library with Air Playit HTTP Server? 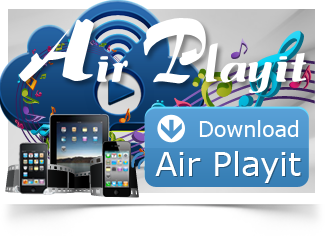 Firstly, free download Air Playit server and run it on your PC or Mac hosting computer which contains the video you want to share. The main interface will show you the port and IP address, which may be used to specify the server address when the client computer is trying to remotely access the video library. Step one: Select directories on the video server that contains your videos you want to share with HTTP server or import video from your iTunes playlist. 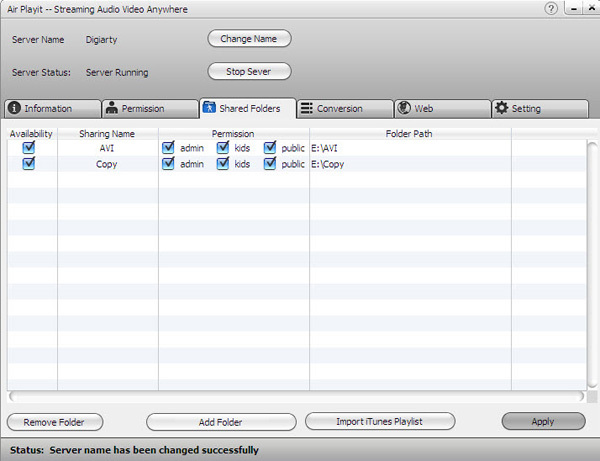 Tips: You may set access permissions as you need after well selected the video and audio to share. It includes Admin, Kids and Public. Step Two: Click to the "Web" property section, check the "The server can be accessed by web browser" option, and apply it. Then you will be displayed with a URL to visit your server by web browser. 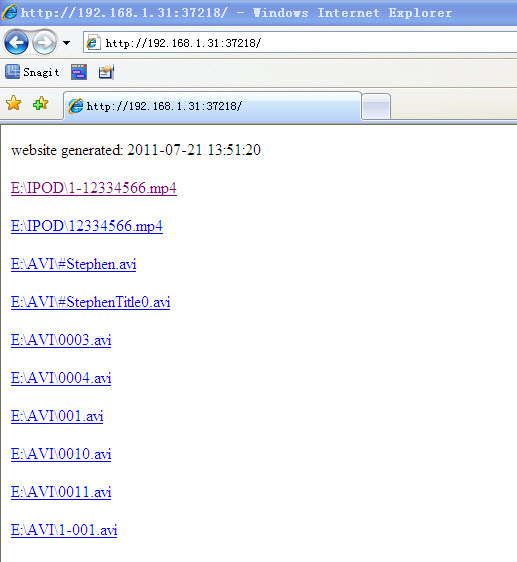 Step Three: Share the displayed URL on the web browser, so that you can access the video file on client computer and take advantage of VLC and Apple QuickTime Player to play the streaming video easily. Using this HTTP server service will save you a lot of headache and you can build your home video library via video sharing from other's server computer. Moreover, Air Playit also could help you stream your favorite video and music audio to your iPhone, iPad, iPod anywhere and anytime, just don't worry about the interminable and dreary conversion process anymore! In addition, this iPhone iPad video streaming app is also capable of streaming music to iPhone iPad, and saving all music files on your iPhone iPad. If you also have willing to rip DVD video to airplay on iPhone iPad etc., the following tool is a must-have. WinX DVD Ripper Platinum can rip DVD to digital formats like MP4, H.264, AVI, WMV, MOV etc., backup DVD to a single MPEG2 file with no video/audio qulity losing on Windows (10) PC/Mac. So that you can stream DVD movie to iPhone/iPad/TV with Air Playit perfectly. Air Playit is a new personal video music cloud server excelling at streaming audios/videos to iPhone/iPad/iTouch from home computer or other computers available; it is a home cloud enabling users to play up to 320 different a/v formats.